Is Facebook Slingshot Third Time’s A Charm Or Strike Three? Facebook has today launched strike three against Camp Snapchat with Slingshot. As with many of Facebook’s recent products (like Paper), Slingshot is an already-proven idea dressed up in an expensive UI with an established distribution network of billions. Despite the fact that most social apps fail, it should be a home run. But it won’t be. And not because it’s different from Snapchat, and not because it’s the same. Not because it’s prettier, and not because it has the cool “reciprocation” feature. The reason Slingshot will flop, just like Paper and Poke and Camera and whatever else, is because of Facebook. Slingshot marks Facebook’s third attempt in two years to capture the Snapchat audience. It’s an undefined group, but assumed to be young — ranging from teenagers all the way up to 35-year-olds who are “keeping it real.” It’s a coveted group of trend-setting future spenders, and it’s the same group that has slowly migrated off of the almighty Facebook platform. The company’s endless attempts at ephemerality, and to attract that magical trend-setting demographic, are clear… There was Poke, and Paper for a hot minute, and then the rumored $3 billion Snapchat acquisition attempt. So far, nothing has stuck. Facebook is 10 years old. We’re no longer watching Zuck wade into the wide world of advertising. Facebook is a major global corporation. Just look at the company’s strategic moves in the past few years: Facebook pays $2 billion for being behind Google in wearables and VR. Facebook pays $19 billion for not having a mobile OS. Facebook pays $1 billion to make sure it’s the center of the world’s photos. I don’t see world-changing ideas playing out. I see one of our four platform horseman in the midst of a Cold War. So, when we laughed at Facebook’s first punch (or should I say Poke) at Snapchat, Zuckerberg loosened up the purse strings and reportedly made a $3 billion offer to buy it. To be fair, an acquisition isn’t technically an attempt to “clone,” but the intent remains the same. When Facebook couldn’t half-heartedly clone Snapchat the first time around, it threw money at the problem. Fast forward to today, and we all have front-row seats to Facebook’s third at-bat to win over the Snapchat crew. And as it so often does, history will repeat itself once again. Admittedly, Facebook’s Slingshot is much more than a Snapchat clone. Unlike Poke, which mimicked every single feature of Snapchat down to a T, Slingshot tries to be a different kind of ephemeral. Slingshot promises reciprocation by forcing you to respond to a message before you can see the content inside. It’s a clever trick to differentiate, but hardly a new idea. Povio did something similar long ago, and an app called Look launched recently in Los Angeles with the same core feature set. And so you might think, now that Facebook’s assault on Snapchat includes a new weapon, maybe the fates will smile on blue instead of yellow. But no. I’m placing my bets now: Slingshot is the next Poke. See, the problem isn’t timing. It’s not that Snapchat beat Facebook to ephemerality, although of course that plays a role. It’s also not ephemerality itself, or photos or videos or text messages. 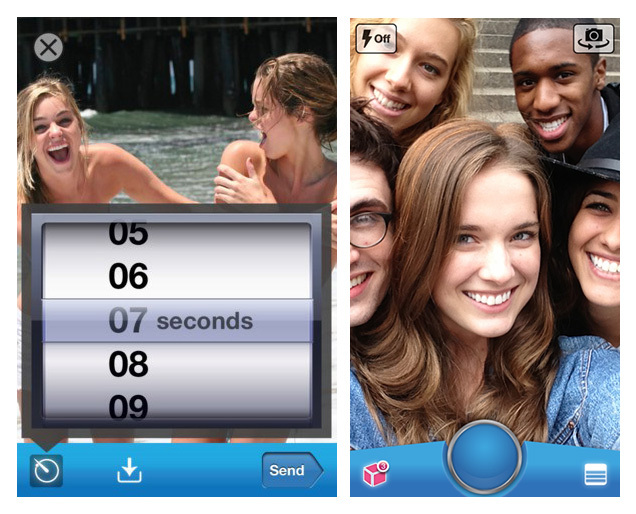 The problem isn’t that Poke was too similar to Snapchat, or that Slingshot is too different. The problem isn’t even reciprocation, despite how attractive that is as a feature. The group that Facebook is chasing is a group that will never rest easy being a part of the majority. There is a reason the “Snapchat demographic” is so valuable: They set trends, which are then followed by the rest of the world. I’m not just talking about teens, though teens do play a vital role in this group. I’m simply talking about the category of people that are intrinsically rooting for the underdog. The people who hate Starbucks and Apple just because they’re Starbucks and Apple. The people who want to try something different. And when that something different also appeals to a group of people obsessed with fitting in (like teenagers), you’re really in business. But how can a group of people set trends without going against the incumbent? If everyone blindly (lol) went to LensCrafters for their whole life and never even thought to look elsewhere, there would be no Warby Parker. But because there are a group of people who are willing to try something new and different, companies like Airbnb and Tom’s and Snapchat exist. The evidence of this trend setters’ exodus from Facebook is anecdotal. But the sentiment is echoed over and over again: To the cool kids, Facebook just isn’t that cool anymore. Facebook even admitted decreased usage among teens last year. The world of technology moves fast, and that’s a lazy understatement. Without blinking an eye, Facebook went from a homegrown, underground, exclusive social network to Coca-Cola. To Merrill Lynch. To the man. The same kids that were desperate to turn 13 just so they could get a Facebook profile now understand the complexities of what’s happening. Their friendships, photos, locations, relationships, age and everything else about them is being used to sell ads to them. They watched as Facebook went public. They saw stories about billionaire Zuck wearing a hoodie. They witnessed the $1 billion Instagram acquisition and the $19 billion WhatsApp acquisition. The subtlety of the business isn’t so subtle anymore. But Snapchat doesn’t feel like a business yet. Remember the original Snapchat? All ugly and bubbly? It looked like the first draft of something, and still, as Snapchat’s user numbers grew and the company found itself in features in the New York Times, the ugly UI remained. The company left the app rough around the edges for a reason: It made users feel like they were in on the ground level of something. Eventually, the app outgrew its childish UI (sort of), and eventually it will outgrow the hip and cool demographic. Every trendy new thing does. Slingshot, unfortunately, will probably not get that chance.